Below is a message from a subscriber to ReturnToExcellence.net that transmits the lead editorial (red highlights by me) in Thursday's WSJ re the release last week of revised lower breast screening guidelines made by the U.S. Preventative Services Task Force - a federally funded task force meaning that BO paid for it. The group's recommendations were published in the Annals Of Internal Medicine. They dropped guidelines for women to have a mammogram every year starting @ 40 & replaced them with recommendations for testing done every other year from 50 to 74. For anyone who thinks that rationing is not part of BO's universal healthcare plan please consider these reduced (read rationed) breast care recommendations were coupled with a call later in the week by the American College Of Obstetricians & Gynecologists for reduced cervical cancer screening . All of a sudden Pap tests are now recommended @ a later age & @ less frequent intervals. It is obvious that BO plans to partially offset the increased costs of insuring the currently uninsured by reducing both the number & scope of medical procedures of those currently insured. Finally we have found a topic where BO's administration thinks costs matter. The reduced number of PAP tests & mammograms being recommended admits that less healthcare treatment & screening results in lower costs. Now why can't we apply this principle to consumer driven healthcare without all of the trillion dollar reforms that BO & Congress are planning for one sixth of our economy? But then you know the answer to that. None of the 16 members of the breast screening panel who were interviewed could recall how many members voted for the revised lower guidelines but all could say that there was a consensus - in other words the members of the panel hope the blame will go to the anonymous task force itself & not the individual members as if the members have no culpability. This is the type of malicious faceless entity that will control our medical procedures under BO's universal healthcare plan. Now these two panels want us to believe that their so-called independent work the same week revising long standing guidelines for both breast & cervical cancer testing that have saved so many lives is merely a coincidence. We don't know how dumb BO thinks we are but it is obvious that he certainly plans to find out. I can hardly wait to find out too. The mammogram decision is a sign of cost control to come. A government panel's decision to toss out long-time guidelines for breast cancer screening is causing an uproar, and well it should. This episode is an all-too-instructive preview of the coming political decisions about cost-control and medical treatment that are at the heart of ObamaCare. As recently as 2002, the U.S. Preventative Services Task Force affirmed its recommendation that women 40 and older undergo annual mammograms to check for breast cancer. Since regular mammography became standard practice in the early 1990s, mortality from breast cancer—the second leading cause of cancer death among American women—has dropped by about 30%, after remaining constant for the prior half-century. But this week the 16-member task force ruled that patients under 50 or over 75 without special risk factors no longer need screening. So what changed? Nothing substantial in the clinical evidence. But the panel—which includes no oncologists and radiologists, who best know the medical literature—did decide to re-analyze the data with health-care spending as a core concern. The task force concedes that the benefits of early detection are the same for all women. But according to its review, because there are fewer cases of breast cancer in younger women, it takes 1,904 screenings of women in their 40s to save one life and only 1,339 screenings to do the same among women in their 50s. It therefore concludes that the tests for the first group aren't valuable, while also noting that screening younger women results in more false positives that lead to unnecessary (but only in retrospect) follow-up tests or biopsies. Of course, this calculation doesn't consider that at least 40% of the patient years of life saved by screening are among women under 50. That's a lot of women, even by the terms of the panel's own statistical abstractions. To put it another way, 655 additional mammograms are more expensive in the aggregate. But at the individual level they are immeasurably valuable, especially if you happen to be the woman whose life is saved. The recommendation to cut off all screening in women over 75 is equally as myopic. The committee notes that the benefits of screening "occur only several years after the actual screening test, whereas the percentage of women who survive long enough to benefit decreases with age." It adds that "women of this age are at much greater risk for dying of other conditions that would not be affected by breast cancer screening." In other words, grandma is probably going to die anyway, so why waste the money to reduce the chances that she dies of a leading cause of death among elderly women? The effects of this new breast cancer cost-consciousness are likely to be large. Medicare generally adopts the panel's recommendations when it makes coverage decisions for seniors, and its judgments also play a large role in the private insurance markets. Yes, people could pay for mammography out of pocket. This is fine with us, but it is also emphatically not the world of first-dollar insurance coverage we live in, in which reimbursement decisions deeply influence the practice of medicine. More important for the future, every Democratic version of ObamaCare makes this task force an arbiter of the benefits that private insurers will be required to cover as they are converted into government contractors. What are now merely recommendations will become de facto rules, and under national health care these kinds of cost analyses will inevitably become more common as government decides where finite tax dollars are allowed to go. In a rational system, the responsibility for health care ought to reside with patients and their doctors. James Thrall, a Harvard medical professor and chairman of the American College of Radiology, tells us that the breast cancer decision shows the dangers of medicine being reduced to "accounting exercises subject to interpretations and underlying assumptions," and based on costs and large group averages, not individuals. "I fear that we are entering an era of deliberate decisions where we choose to trade people's lives for money," Dr. Thrall continued. He's not overstating the case, as the 12% of women who will develop breast cancer during their lifetimes may now better appreciate. More spending on "prevention" has long been the cry of health reformers, and President Obama has been especially forceful. In his health speech to Congress in September, the President made a point of emphasizing "routine checkups and preventative care, like mammograms and colonoscopies—because there's no reason we shouldn't be catching diseases like breast cancer and colon cancer before they get worse." It turns out that there is, in fact, a reason: Screening for breast cancer will cost the government too much money, even if it saves lives. Below is a message from Steve Lonegan that immediately affects NJ & could easily spread to other states. Steve's message pertains to NJ's lame duck Senate getting ready to pass a homosexual marriage bill. The point is that the Democrats do not have the votes to pass such a measure so four Republicans came from nowhere to provide the needed votes for passage. Worse yet, if possible, Governor-elect Chris Christie who had campaigned as a traditional values conservative opposing homosexual marriage & who also had accepted support from groups like the NJ Family Policy Council has remained silent on the matter. Now I had some great discussions with many of you just before the election re the importance for all of us to find candidates who live & will govern by the principles that our country was founded on. This was also one of Alan Keyes main points in his speech @ the Woodbridge Tea Party on October 24. Chris Christie was not such a candidate - I thought Christie would come in and tinker around the edges for a few months & it would not be long before you would not be able to tell the difference between Christie's & Corzine's governance. I never thought it would be this soon that the similarities would surface but I sure am glad that neither Carol or I voted for Christie. Just read the horror story below & if this is important to you call any of the people Steve lists @ the end of his message if you have not worn your fingers out during the last ten months. Last Friday "gay" marriage was DOA. State Senate Judiciary Chairman Paul Sarlo, a Democrat, said that he wasn't going to bring the bill to enact it before his committee, because he didn't think it had the votes to pass during the "lame duck" session. But something happened over the weekend. According to NJN, four liberal Republicans in the New Jersey Senate - Bill Baroni, Jennifer Beck, Kip Bateman, and Sean Kean - said that they would provide the votes to pass gay marriage in New Jersey. That's right, the Democrats lacked the votes to pass gay marriage, so they weren't going to even try. Then four liberal Republicans crossed-over to help and now it looks like New Jersey will have gay marriage. This is a flip-flop, because legislators like Jennifer Beck are on record as opposed to ramming through votes during the lame duck session, after an election, when no one is paying attention. Voters in thirty one states have voted on and defeated gay marriage. Apparently, these four "Republicans" would deny New Jerseyans the right to vote on this culture changing issue, and they would condone slipping it through in the still of the night. During his run for Governor, Chris Christie campaigned as a traditional values conservative and is on record as opposing gay marriage. State Senator Tom Kean Jr. - the leader of the Senate Republicans - is on record as supporting an amendment to the state constitution to define marriage as between one man and one woman. Christie and Kean have each received the benefits of the support of New Jersey's traditional values conservatives. Both have been favored by groups like the New Jersey Family Policy Council. Now, they have fallen silent. We needn't have gay marriage in New Jersey. A strong, clear statement by Governor-elect Chris Christie and Senator Tom Kean Jr. will help these four Republican State Senators to think again. As Kean said in 2006, when the State Supreme Court first raised the issue of gay marriage, "The eyes of the country are on New Jersey." Please call Governor-Elect Christie and Senator Kean and ask them to implore these four Republicans to oppose a vote by the legislature on gay marriage and support putting the question on the ballot for all the voters of New Jersey to decide. Contact Senator Tom Kean Jr.
For anyone who missed Barbara Panella & me on the radio last Thursday just click on click here to hear the audio to hear the show. Congressman Frelinghuysen e-mailed the statistics below that are behind our jobloss recovery. The original message brought many personal accounts like two from one member alone - "I remember when I was in first grade, in Rahway, walking to school a distance of approximately one mile. (Forty years ago we walked to school.) In that one mile I passed Purolator Oil Filter, Merck, Virginia Barrel, Regina, and dozens more. The corporate parking lots were filled with cars. I remember being late for first grade and the Nuns would crack my knuckles because I stopped to watch a big truck back into the loading dock. Today, these companies are gone. The liberals were successful of ridding this country of the evil corporations that make things and have greasy by products. In this country we cannot have a company that creates smoke or dirt. My heart goes out to the kids in grammar school who will never know the joy of watching an 18 wheeler back into the loading dock or the fun walking to school with their buddies. If we have no evil corporations, surprise surprise, we have no jobs." A later thought from the same member - "Doug: It wasn't that many years ago we always understood that our best days were ahead of us...funny how we don't hear that tune in a jobloss recovery." 15,700,000: Americans unemployed and looking for workthe highest number ever. Since the President signed the trillion dollar "stimulus" in February, the number of unemployed Americans has increased by nearly three million. 190,000: Individuals whose jobs were eliminated in October. 1,737,000: People unemployed in October because they have been laid off. 2,804,000: Jobs lost since the "stimulus" was signed in February. 9,284,000: People who are working only part-time because they cannot find full time employment. 2,373,000: People who want work, but who are not currently looking because of the state of the economy. 5,594,000: People unemployed and searching for work for more than 27 weeksthe highest level ever. 1,090,000: Job seekers that are new entrants to the workforce and have yet to find a job. 26.9: Average number of weeks job seekers are unemployed after losing their jobsthe highest number since the statistic was first recorded in 1948. 27.6%: Unemployment rate among job seekers between the ages of 16 and 19the highest level since the statistic was first measured in 1948. 15.7%: Unemployment rate among African Americansthe highest level since 1985. 13.1%: Unemployment rate among Hispanics and Latinos. 17.5%: Rate of underemployment, accounting for the unemployed and those who are unable to find adequate work. 15.5%: Unemployment rate among job seekers without a high school degree. 65.1%: Rate of the U.S. population in the workforce. About this time last year & up to the inauguration BO was seen everywhere with his sign "Office Of The President-Elect." Now of course there is no such office - it was just something BO made up. More recently BO claimed that the Stimulus "saved or created" over 1 million jobs. Now there is no such term "saved jobs" in any economics book so once again this is a term BO made up. With re to "creating jobs" - please refer to what Stuart Meyers used to define as a job to his students - "A job is an opportunity to create more present or future value for an employer than it costs to maintain the worker in the job" - otherwise the job disappears. These are not the types of sustainable wealth creating jobs the Stimulus produces. Schramm, Litan, & Strangler report that it is new businesses less than five years old that have created nearly all net jobs since 1980 - without new businesses job creation in the American economy would have been negative for many years. 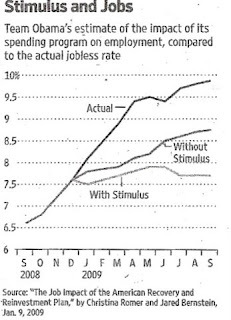 The truth is that BO claimed that unemployment would not go higher than 8% if the Stimulus was enacted & that his economic staff predicted that the unemployment rate would be 7.7% by October with the Stimulus & 8.7% if the Stimulus was not enacted. We all know that these figures have been far exceeded - the unemployment rate of the labor force in October is 10.2%. not 7.7%. Since the Stimulus was enacted unemployment has increased in every state except North Dakota. Counting discouraged workers (who are not considered part of the labor force) & part time workers who really want full time work results in an unemployment rate of 17.5%. Despite these terrible unemployment figures the quarter ending September 30 recorded an initial 3.5% GDP seasonally adjusted annual rate expansion. These initial GDP figures are regularly adjusted up or down. Also much of the growth was due to the "cash for clunkers program," "the first time home buyers tax credit", & government purchases so it is surprising that many economists believe that the recession ended in June - of course the National Bureau of Economic Research, the official determiner of recession starting & ending points won't make that call for many months to come. Employment is considered a lagging indicator & yet until the recession that ended in November 1991 that lag was really only a few months. If June was the end of the recession we don't have a jobless recovery like most economists are saying but rather a jobloss recovery - this is the third such jobloss recovery in a row where unemployment continued to grow long after the respective recession ended. For an explanation of why & what role the Stimulus plays please refer to the following excerpt from Henry Hazlitt's 1946 Book entitled "Economics In One Lesson" (thanks to Mark Levin & Carpe Diem I have posted the work in its entirety on ReturnToExcellence.net). Hazlitt's book was first published at a time of rampant statism at home and abroad - much like today. To get the most out of the following excerpt please read it with the definition of a real American job defined above in mind. "There is no more persistent and influential faith in the world today than the faith in government spending. Everywhere government spending is presented as a panacea for all our economic ills. An enormous literature is based on this fallacy, and, as so often happens with doctrines of this sort, it has become part of an intricate network of fallacies that mutually support each other. A certain amount of public spending is necessary to perform essential government functions. A certain amount of public works  of streets and roads and bridges and tunnels, of armories and navy yards, of buildings to house legislatures, police and fire departmentsis necessary to supply essential public services. With such public works, necessary for their own sake, and defended on that ground alone, I am not here concerned. I am here concerned with public works considered as a means of "providing employment" or of adding wealth to the community that it would not otherwise have had. A bridge is built. If it is built to meet an insistent public demand, if it solves a traffic problem or a transportation problem otherwise insoluble, if, in short, it is even more necessary to the taxpayers collectively than the things for which they would have individually spent their money had it not been taxed away from them, there can be no objection. But a bridge built primarily "to provide employment" is a different kind of bridge. The bridge has to be paid for out of taxes. For every dollar that is spent on the bridge a dollar will be taken away from taxpayers. If the bridge costs $10 million the taxpayers will lose $10 million. They will have that much taken away from them which they would otherwise have spent on the things they needed most. Therefore, for every public job created by the bridge project a private job has been destroyed somewhere else. We can see the men employed on the bridge. We can watch them at work. The employment argument of the government spenders becomes vivid, and probably for most people convincing. But there are other things that we do not see, because, alas, they have never been permitted to come into existence. They are the jobs destroyed by the $10 million taken from the taxpayers. All that has happened, at best, is that there has been a diversion of jobs because of the project. More bridge builders; fewer automobile workers, television technicians, clothing workers, farmers." Below are just two of the responses to the subject bill & vote that sums up the responses communicated to me. Sums up my feelings too. 1,990 pages - who read them all? how many quiet paybacks can they put in 1,990 pages? This is transparency???? Thanks, sent to my list of 30, doubt if they voted for them in the first place, just in case sent it on. In the last 48 hours, as predicted, under the cover of everyone trying to stop Pelosi's 1,990 page healthcare reform bill the Senate Environment & Public Works Committee passed the Boxer-Kerry Cap & Trade Bill by a vote of 11 to 1. All Republicans on the committee boycotted the vote & only Montana Senator Max Baucus voted against it. Above are two photos courtesy of AFP of some of the 20,000 plus people who went to Washington yesterday for the anti-Pelosi healthcare reform bill rally held on the steps of the Capitol. After the rally the attendees, each with pages of the bill, went into the three Congressional office buildings trying to find Members who support the bill to see if they can explain it. Most of these Members were no where to be found. Take a good look @ the people in the attached photos. They are virtually the only thing standing against passage of Pelosi's bill that is now scheduled to be voted on this weekend. We can also thank the Republican Members of the House who participated in the rally that was led by Minnesota Congresswoman Michele Bachmann. If stopping Pelosi's healthcare reform bill is important to you & you don't think you have done as much as you can to participate in stopping it the time is getting very short. If you don't know what to do to help just let me know & I will give you some ideas. Unfortunately as we see above we will soon get another tiresome chance to beat back BO's relentless onslaught to destroy our way of life when the Cap & Trade bill comes to the Senate Floor. House Speaker Nancy Pelosi is planning a floor vote on her 1,990 page healthcare bill on Friday. California Senator Barbara Boxer is also trying to slam the Kerry-Boxer Cap & Trade Bill through the Senate Environmental & Public Works Committee this week under the cover of everyone concentrating on healthcare. 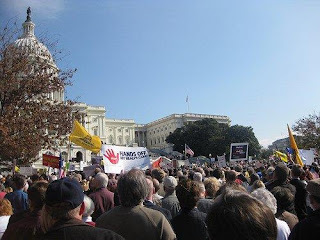 Countering @ least the healthcare vote is the planned national “Congressional House Call” on Thursday @ 12 noon on the steps of the Capitol with Congresswoman Michele Bachmann, Jon Voight, Mark Levin, & many others who will host the grassroots effort once again asking people to join in to fight back against BO's anti-American onslaught. Bus trips have been arranged - just let me know if you would like to go & need the bus information. 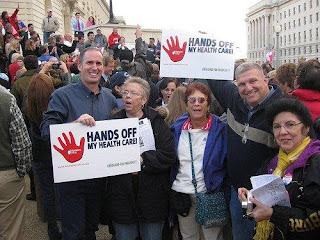 Americans For Prosperity has also organized an effort for people to go to their Members local offices to wage a similar anti-Pelosi healthcare reform bill protest. I can help with details on this also if you need it. Please call or fax your Member if you cannot attend - it all adds up. Just like the recent tea parties & town hall meetings this type of grassroots activity is the only thing standing in the way of the government takeover of healthcare - with Cap & Trade now trying to gain a simultaneous priority. The video below shows just how despicable Iowa Congressman Steve King thinks all of this is. Below are three responses to the subject message that I selected because they are not from anyone who I had the original recent discussions with on the NJ Gubernatorial election matter. All three responses express dissatisfaction with the current electoral condition & not just in NJ. So the question is what do we do about it? Our best hope is to get involved every chance we can to unseat BO's plans between now & Nov 2010 when we once again have a chance to find some people who earn our vote & really have the country's interest @ heart rather than merely staying in high paying, plush jobs with many perks. The same applies to solving state-level problems. At least in NY's 23rd district those people have a real choice thanks to the candidate himself sticking in & the leadership of those, starting with Sarah Palin, who endorsed the Conservative against the wishes of the detestable NY Republican machine. Just think how we would feel in NJ if something like that had happened here last Spring - we would have the real choice now of Steve Lonegan vs. Jon Corzine, not some phony malleable hand picked candidate who can't articulate a position on anything. Glenn Beck writes in his book "Common Sense" - "Every time you vote 'against' someone rather than 'for' someone the two party system wins & America loses." I tend to agree with you - Corzine and Christie are poor choices. Christie has a lot of negatives against him. Corzine not saying much of anything. Its a NO WIN situation. Neither is saying how they hope to improve conditions except in vague terms. Interesting to get your slant on the NJ gov race....have been following it on the national news...I suspect that IL will be up against something like what you have there come gov election time. You have a good point, except how long will it take to fill the bucket. The NJ Senate & Assembly both have to be changed as well before much of any candidate will mean much at all. With a Christie vote at least a quart will go in the bucket, other wise the bucket stays dry and Corzine will poke a larger hole in the bottom. Now is the time to ban together, not in the next four years where third candidates have no chance of carrying the bucket at all. If they want a shot at the prize they should run in the primaries. I also would have liked Lonegan, but it wasn't to be.